Who is it for? Dove Purely Pampering Nourishing Bodywash is a moisturizing shower cream. If you are a coconut fragrance lover or just want an indulgent body wash then it’s definitely for you! Wet the skin. Take the desired amount of product on the palm or to the loofa and massage with gentle upward circular motion. Rinse off with water. This body wash comes in a white colored opaque plastic bottle with flip-top cap. The packaging is travel-friendly and leak proof. Its ergonomic shape is another plus point of the packaging. The shower wash is white in color and its consistency is on the runny side. It does not have any scrub beads; it has a smooth texture. It produces sufficient amount of lather. The lather is definitely more with loofa. It is a moisturizing wash so it does not dry out the skin afterward though I follow it up with body moisturizer. This is a plus point of this body wash. It smells like coconut and has a very sweet flowery note. The fragrance gives a spa-like calming feel. It can be my favorite winter body wash. I love this kind of rich aroma with warmth. Though my facial skin is combination and acne prone, my body skin is normal. This body wash feels quite nourishing and soothing. I really enjoy the fragrance of it. It is a moisturizing product so the skin does not feel stretchy after a shower. I can easily skip body lotion if I am using this but I don’t think I could leave out body moisturizer after it in extreme winter. Overall this body wash gives a pampering feel to my everyday shower routine. What do I like about this body wash? What I dislike about this body wash? Yes definitely! I love this coconut based body wash so I will buy it again. 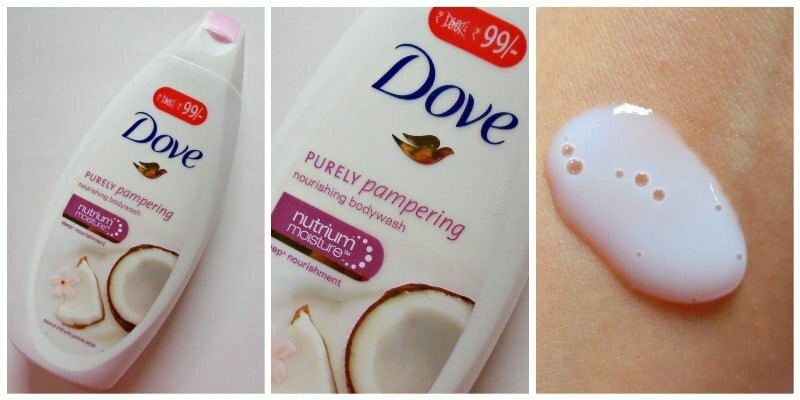 I would recommend it to everyone who loves warm and sweet smelling body wash.
More from Dove Purely Pampering Range? I will try this for sure! !